◊ Nov. 21 Thanksgiving Meal at Good Sam 5:30 pm (potluck) with a short worship service at 7 pm. Join us as we celebrate the life and ministry at Good Sam. Festivities will begin after church and we’ll have food, fun & games at the church. We’ll also have a “God’s Work. Our Hands.” activity set up in the Fellowship Hall. See more about our fun GWOH activity in the article below. This will be a fun-filled day of activity and fellowship for all! Council will be providing hot dogs, hamburgers, and the fixings. Please let us know on the sign up in the Fellowship Hall (and/or when passed around during Worship) if you’ll be attending and if you’ll be bringing a side dish to share. If you have some fun outdoor games like corn hole or ladder/ball toss, please bring them. All games are welcome! September 9 is also Rally Day—our Sunday School season kick off. This will be an action-packed, fun-filled day! Following Worship and a light Fellowship, the Jr. High youth will meet with their teachers in Pastor’s office and the Sr. High youth will meet in the Disciples Den at 10:30 A.M. Children 3 years (and potty-trained) through 6th grade will meet in the Sanctuary at 10:30 A.M. Parents are encouraged to stay, as we will gather for music before we disburse to classrooms for a short meet & greet with your child’s teacher. Parents, please be sure to fill out a Sunday School registration form for each of your children so we know of any allergies and how to contact you in case of an emergency. The forms can be found in the Fellowship Hall on the Sunday School bulletin board and Mary Dickinson will have them on hand as well. Please touch base with Mary D. if you have questions. During Rally Day & the Church Picnic next Sunday, September 9, we have a fun GWOH activity to create special gifts for the teachers (and students) at Carver Elementary School. We’ll be making supply “Kit Cakes” to help the teachers defer some costs to supply their students with what they’ll need in the classroom. To implement this activity, we need your help with donating the following: dry erase markers, pencils, Elmer’s glue, 24-count crayon boxes, glue sticks, pretty color masking tape, paper towels, index cards, rubber bands, and whatever other school supply you’d like to donate. So when you’re out collecting supplies for your kids…throw an extra couple supplies in for the Carver kiddos!! If you don’t have students… we just gave you an excuse to GO SHOPPING!!! Please bring all donations to church anytime! There’s a collection box in the Narthex. Looking forward to seeing all the creative expression. 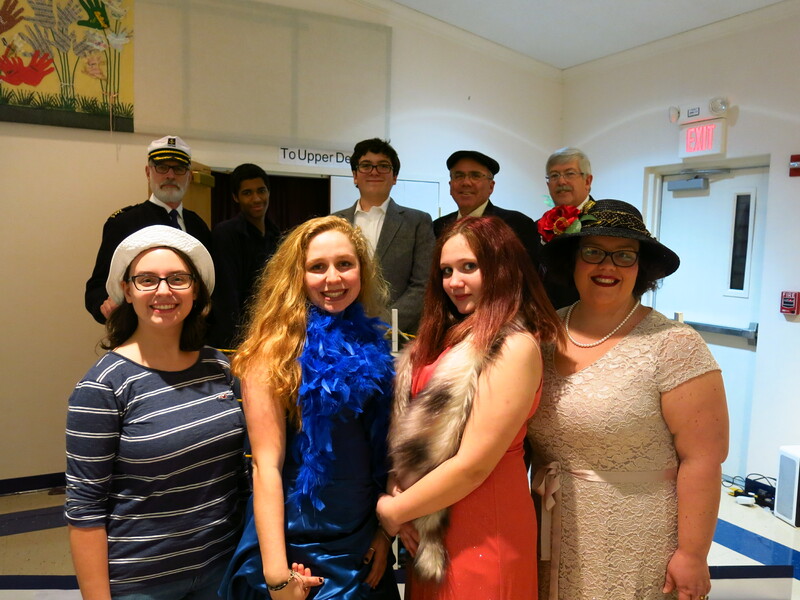 Dinner Theater Fundraiser for Youth Attending ELCA Youth Gathering a HUGE Success! On Saturday evening, Feb. 24 the S.S. Gigantic set sail in our church Fellowship Hall and what a great fellowship event it was!! The Empty Nester Group had fun collaborating with the Sr. High Youth and their families and ended up with a great dinner, theater show and a very successful fundraiser. The evening’s events–including dinner, the theater show S.S. Gigantic, and basket raffle–the groups raised $2364 to help send our Sr. Youth to Houston for the Triannual ELCA Youth Gathering this summer. This was just one of several fundraising events to help defer costs involved to send 19 of our youth and adults to the Gathering June 27-July 1, 2018. There are many to thank starting with Thrivent who offset our costs with $500, as well as, many individuals who gave their time, talent and funds to support the event. So, thank you, thank you, thank you to so many people that made this event so successful. Thanks to Martha and her great cast for a wonderful play…it was a lot of fun. Thank you to our musicians, to the ticket staff, to Chuck for taking pictures, to Laurie and Ron for taking care of the bar, to all of our servers, to Mary, Steve, and Nancy for taking care of the kitchen….serving up the food and washing all the dishes. Thank you to Jennifer for the Playbill, to Ginger and Chris for the yummy dessert, to Judy for putting the raffle baskets together as well as all those that contributed, to John M. for microphones and also videotaping, to Dennis for handling the finances, to Ginger for the costumes, to Diane for decorations and to Pastor Mitch for taking care of the prayer as well as some other coordination that needed to happen. Thank you to all who stayed and helped clean up and put the church back in order and for all that may not be mentioned because everyone’s efforts were truly appreciated. We could not have set sail and accomplished such a wonderful evening without everyone pitching in. View the play, S.S. Gigantic with the Good Sam Players, in it’s entirety. We wish the youth a wonderful and faith-filled trip to Houston. Sip artisan wines amongst friends, and discover your new favorite sparkling, white, and red varietals. Join us for a tour of fine regional wines at the Kowalik’s home! Our guide, Andrea Daniels of WineShop at Home, will bring the vineyards to us, pairing artisan wines with light appetizers as she walks us through each tasting. We look forward to a fun, refreshing evening with our friends and to start some early Christmas shopping. Please RSVP to Diane Hay as soon as possible so we can reserve a glass for you. The first pour will be at 7:15 P.M.—you’ll want to arrive on time and be ready to taste every last drop! Join us at 9:30 A.M. on Tuesday mornings to share some coffee, read and discuss the lessons for Worship on the coming Sunday and imagine together what themes and messages they hold now for us and for our community. We will have time to care for each other and finish in prayer. Come and join us beginning November 7 at 9:30 A.M.